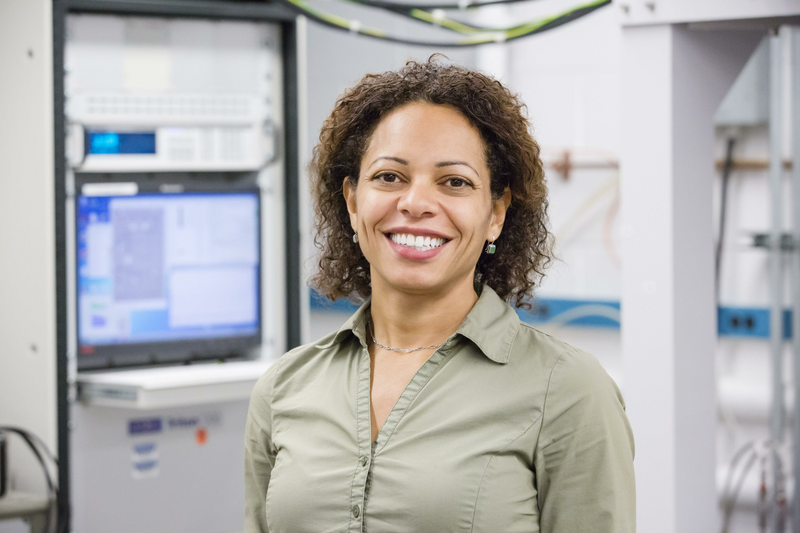 Mason is an experimental condensed matter physicist who has earned a reputation for her deep-sighted and thorough lines of attack on the most pressing problems in strongly correlated nanoscale physics. Early in her career, Mason developed innovative new methods to fabricate and control quantum dots in carbon nanotubes. She then turned her focus to the study of correlations in carbon nanotubes and graphene, where her studies opened up new areas of research, most significantly, the non-equilibrium Kondo effect demonstrated in 2006 and the determination of individual superconducting bound states in graphene-based systems in 2011. More recently, Mason’s work has focused on electronic transport in graphene, nanostructured superconductors and semiconductors, and other novel 1D, 2D, and 3D systems. In 2013, in collaboration with colleagues at Brookhaven National Laboratory, Mason was among the first to measure superconducting surface states in topological insulators that were not confounded by interference from sample impurities. Most recently, with colleagues in the Department of Physics, the Materials Research Laboratory, and the Department of Electrical and Computer Engineering at the U of I, she is the first to experimentally elucidate the origin of finite momentum Cooper pairing in 3D topological insulator Josephson junctions. Mason serves her scientific community in several roles. She is the director of the Illinois Materials Research Science and Engineering Center (I-MRSEC) on the Urbana campus. Funded by the National Science Foundation with additional support from the University of Illinois at Urbana-Champaign and the Frederick Seitz Materials Research Laboratory, the center is dedicated to performing fundamental, innovative materials research with applications to societal needs and to supporting interdisciplinary education and training of students in materials design. Mason is also a member of the 2018/19 class of the Defense Science Study Group, a program of education and study in national defense and security challenges directed by the non-profit Institute for Defense Analyses and sponsored by the Defense Advanced Research Projects Agency. From 2014 through 2017, Mason served as a general councilor of the APS. Mason has long been an avid spokesperson for diversity, inclusion, and equity in the sciences and as such served as chair of the APS Committee on Minorities. She also served as one of the theme leaders for the DOE Basic Energy Sciences cluster on quantum materials and nanoarchitectures (2013). Mason is the recipient of many recognitions. She is the John Bardeen Faculty Scholar in Physics at the U of I (2014–). She is also the recipient of the U. of I. College of Engineering Dean’s Award for Excellence in Research, the Maria Goeppert Mayer Award of the APS (2012), a Center for Advanced Study Fellowship (2011-2012), the Denice Denton Emerging Leader Award (2009), a Woodrow Wilson Career Enhancement Fellowship (2008-2009), and a National Science Foundation CAREER Award (2007). Mason received a bachelor’s degree in physics from Harvard University in 1995 and a doctorate in physics from Stanford University in 2001. She returned to Harvard for postdoctoral training, where she was elected junior fellow in the Harvard Society of Fellows. She joined the faculty at Illinois Physics in 2005.